Join Latin Women’s Business in celebrating our 1 year anniversary. It will be a memorable event with the opportunity of networking with supporting women and men. Plus, there will be a silent auction which includes an Audi for a weekend. Tickets are $30 and include food, water, and one free alcohol drink. Hey, I found this article from Latin Women's Business and thought you would appreciate it, "1 Year LWB Celebration". 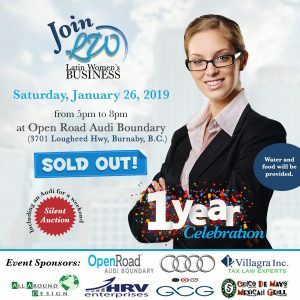 Here is the article link: https://www.lwbusiness.ca/event/1-year-lwb-celebration/.